If you holler at someone across your yard, the sound travels on the bustling movement of air molecules. But over long distances your voice needs help to reach its destination—help provided by a telephone or the Internet. Atoms don't yell, but they can share information through light. And they also need help connecting over long distances. Now, researchers at the Joint Quantum Institute (JQI) have shown that nanofibers can provide a link between far-flung atoms, serving as a light bridge between them. Their research, which was conducted in collaboration with the Army Research Lab and the National Autonomous University of Mexico, was published last week in Nature Communications . The new technique could eventually provide secure communication channels between distant atoms, molecules or even quantum dots. An excited atom—that is, one with some extra energy—emits light when it loses energy. Usually atoms spit this light out in random directions and at different times. But this random process can be tamed if excited atoms are bunched up close together. In that case, atoms can sync up their light emissions, like the rhythmic clapping of an appreciative audience. However, this synchronization effect, which is caused by light of different atoms joining together, doesn't reach very far because the strength of light weakens drastically over short distances. While your neighbor might hear you yelling over several meters, atoms need to be really close to interact with each other—typically closer than one micron, which is a hundred times smaller than the width of a human hair. Now, physicists have extended the range over which atoms can synchronize their light emission by using an optical nanofiber. In an experiment, the researchers immerse a nanofiber in a cloud of cold rubidium atoms and excite the atoms with a laser beam. As atoms in the cloud move around, they sometimes get very close to the fiber. If an atom emits light near the fiber, the glass thread can capture the light and pipe it to another atom, even if the atoms are far apart. 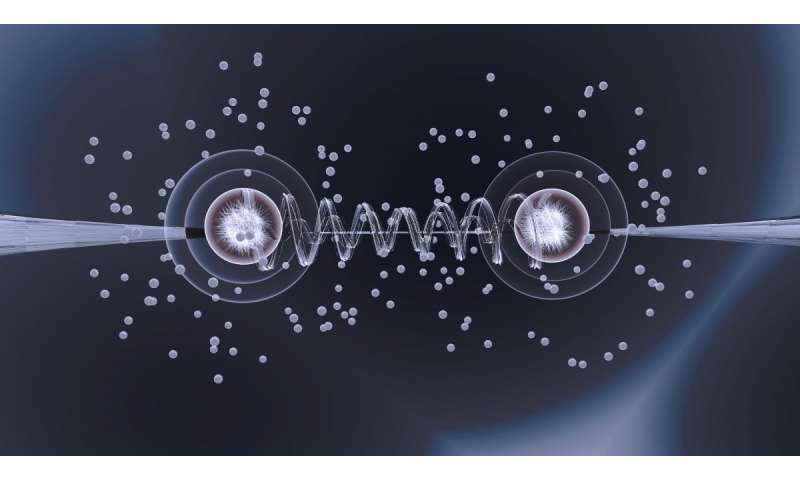 The team observed a group of atoms emitting light pulses at different rates than their ordinary, unsynchronized selves—one signature of these far-reaching interactions. The effect persisted even when physicists cleaved the atomic cloud in two so that atoms in separate clouds could only connect through the fiber, and not through other atoms in the cloud. The atoms in this experiment are only separated by distances of a few pieces of paper, but the authors say that longer distances—meters or even kilometers—should be doable. "We have shown that optical nanofibers are excellent for connecting atoms that are quite far apart—if the atoms were the size of people, it would be a distance of more than 300 kilometers," says Pablo Solano, the lead author of the paper and a former JQI graduate student. "The question now is not whether the atoms interact, but how far can we push their optical-fiber-mediated connections." On the scale of atoms even a few meters is an enormous distance. But the authors say that a combination of optical nanofibers and regular fiber optics—technologies already deployed for long-distance phone calls, cable TV and the Internet—could extend the range of these atomic connections even farther.